Leo A. Kim, MD, Peter Hao Tang, M.D., Ph.D., Sandra R. Montezuma, MD and Vinay A. Shah M.D. Assigned status Up to Date by Sandra R. Montezuma, MD on September 26, 2017. Retinal prostheses are implantable devices designed to supplant phototransduction within the eyes of individuals with significant retinal diseases such as retinitis pigmentosa. In the normal eye, photoreceptors located within the outer layers of the retina contain light-sensitive pigment that trigger the phototransduction cascade to generate neuronal signals in the presence of light stimuli. These signals are passed to and processed by a complex network of neurons within the middle layers of the retina before reaching the retinal ganglion cells (RGC) within the inner layers. Axonal processes from RGCs ultimately form the optic nerve to transmit the light-evoked neuronal signals to the visual cortex. In congenital retinal dystrophies such as retinitis pigmentosa, the outer layers of the retina where photoreceptors reside are gradually lost, thereby causing progressive visual loss. However, inner retinal layers including RGCs are partially spared. In theory then, restoration of vision may be achieved by creating devices, retinal prostheses, that receive and process incoming light and then transmit the information in the form of electrical impulses to the remaining inner retinal layers for visual function. It was first discovered that electrical stimulation of visual pathways may be perceived as light or “phosphenes” in 1929 by the German neurologist Otfrid Foerster. He used electrodes to stimulate the visual cortex of the brain. In 1956, the first known proposal for a retinal prosthesis type device was outlined by Tassicker in Melbourne, Australia. However, research and design of such a device did not begin until the late 1980s when two different groups, one in Boston, MA and the other in the Raleigh/Durham, North Carolina area, began serious investigations. Subsequent research by Humayun and colleagues revealed that phosphenes could be perceived by both normal and blind patients and through electrical stimulation of the retina. However, threshold charge densities in severely blind patients were significantly higher than that in a normal-sighted patient. Implants of the first retinal prostheses began in 2002 with phase I clinical trials for the Argus I. Nine years later, the next generation Argus® II was approved for marketing in Europe after successful implantation in about 30 patients. Two years thereafter in 2013, the Argus® II became the first retinal prosthetic device to be approved by the FDA for late-stage retinitis pigmentosa. It is estimated that well over $100 million has been spent by sponsors of almost twenty research groups for the development of retinal prosthetic devices in the US, UK, Germany, Japan, Korea, Australia, and China. Although visual prostheses may conceivably be developed for any part of the visual pathway including the visual cortex itself, the retina is considered to be the easiest target for treating outer retinal disease due to its easy access and partially intact geospatial neuronal architecture and processing units. Designs for retinal prostheses are generally categorized based on where in the eye the device is intended to be placed and how the device delivers electrical impulses to RGCs. Most devices are placed either epiretinally, on the retina surface and adjoining the RGC layer, or subretinally, outside of the retina adjoining or in place of the remnants of the retinal pigmented epithelial and photoreceptor layers. Epiretinal designs benefit from being easier and less risky to implant while subretinal designs may benefit by utilizing intact middle retinal layer processing pathways formed by amacrine, horizontal, and bipolar cells. Designs calling for the placement of devices between the choroid and sclera or outside of the sclera also exist. Electrical impulse delivery is accomplished by either micro-photodiode arrays or micro-electrode arrays. The former utilizes an array of tiny photodiodes to generate electrical current from light entering the eye while the latter depends on a camera, processing unit, and a transformer to convert the light from images to corresponding geographical impulses generated by an array of micro-electrodes. Advantages of using a micro-photodiode array include having no need for an external camera, processor, or transformer, and utilization of natural light-mapping on the retina for impulse generation. Micro-electrode arrays, on the other hand, have the advantage of being able to generate larger electrical impulses and may utilize innovative light processing algorithms to highlight contrast, edges, or other features of the visual field. CE Mark (2011) and FDA (2013) approval as a humanitarian device for patients with retinitis pigmentosa (RP). Clinical trials and post-market surveillance studies are ongoing for 30+ RP subjects. (NCT00407602, NCT02303288, NT01490827, NCT01860092, NCT01999049). A clinical trial enrolling 5 subjects with severe age-related macular degeneration is currently recruiting (NCT02227498). CE Mark (2013) approved. Ongoing clinical trials for 45+ subjects with RP (NCT02720640, NCT01024803) No known active clinical trials. Clinical trial underway for 10 subjects with RP, cone-rod dystrophy, or choroideremia (NCT02670980). Website states development of epiretinal device with 150 electrodes and a subretinal device is underway. Completed a pilot study of 3 human subjects with RP, choroideremia, or cone-rod dystrophy (NCT01603576). Website states development of 44 and 98 channel device with 44 channel device planned to begin clinical trials in 2016. Pilot animal studies with 2 mini-pigs complete. Development of 200 electrode device ongoing with plans to enter human clinical trials upon completion. The Argus® II is a second-generation epiretinal, micro-electrode array retinal prosthesis developed and sold by Second Sight Medical Products. It recently was approved for marketing in both Europe (2011) and the United States (2013), being the first device to gain that distinction. Its design differs from the first generation model, the Argus I, in the number and spacing of microelectrodes on the array (6x10 instead of 4x4), the placement of internal processing components (sutured onto the sclera instead of subcutaneous placement inside the temporal recess), and the placement of the external transmission coil (built into the sidearm of the glasses instead of held magnetically by the internal components over the temporal bone). The Argus® II consists of three external components and three internal components. The external components include a video camera mounted in the center of a pair of glasses, a visual processing unit (VPU) that may be hung around the neck or attached to clothing, and a coil attached to the sidearm of the glasses for transmitting data and power wirelessly via radio frequency telemetry to internal components. The internal components include an internal coil, which receives telemetry data from the external components and an internal processing unit called an application specific integrated circuit (ASIC), which is housed in a hermetically sealed casing with a concave surface designed to be sutured onto the sclera. A ribbon of cables connects the casing to a 6 by 10 array of platinum micro-electrodes measuring 200 micrometers in diameter and spaced, center-to-center, 575 micrometers apart embedded in a thin film of polyimide. External photograph of Argus II retinal prosthesis system. The external components consists of a glasses mounted video-camera, a portable computer (video processing unit, VPU), and an external coil. The VPU enables real-time processing of captured scenes and translation into electrical stimulating parameters conveying spatial-temporal information. The external coil allows for wireless transmission of the processed data from the VPU and electrical power to the internal components using radiofrequency (RF) telemetry. A 360-degree peritomy is performed and the hermetic casing is sutured onto the scleral surface in the superotemporal quadrant. The antenna coil is placed under the lateral rectus muscle and sutured to the sclera in the inferotemporal quadrant. The rest of the device’s silicone band is placed under the remaining rectus muscles and joined together in the superonasal quadrant with a Watzke sleeve. Argus® II clinical trials recruited patients with retinitis pigmentosa or other outer retinal degeneration with bare or no light perception (logMAR 2.9 vision or worse) and the implant was placed in the eye with the worse vision. Of the first 30 patients in whom the Argus® II was implanted during clinical trials, 9 experienced adverse events including conjunctival erosion or dehiscence, retinal detachment, hypotony with choroidal effusions, culture negative presumed endophthalmitis, and retinal tack dislocation requiring retacking. All but one of these patients was treated successfully without explantation of the device. Since then, another investigator has published a report of 6 patients in whom the Argus® II was implanted without any severe adverse events after one year. To date, more than 100 patients have received Argus® II implants. Visual function tests in patients with Argus® II implants have shown increases in the subjects’ abilities to recognize and discriminate forms, localize targets, detect motion, and navigate. Because the Argus® II may be turned on and off, most studies have used the implanted patients as their own controls. Studies in form recognition have tested subjects’ two-point discrimination, recognition of high-contrast, large geometric shapes and letters, and 3-dimensional objects in high-contrast settings. For example, with the device turned on the mean percentage of correctly identified white or metallic household objects set in front of a black felt curtain was 35.7 ± 14.6% compared with 12.5 ± 7.2% with the device turned off. For one study in target localization testing, 26 out of 27 subjects were better able to locate and touch randomly placed, white, 200 pixels, 2 squares on a blackened 19” touchscreen monitor with the Argus® II turned on than when it was turned off. When the device was turned on, subjects touched an average of 149 ± 50 pixels from the center of the square compared with 323 ± 94 pixels when it was turned off. Navigational utility of the device has been tested by asking subjects to follow a 15 cm wide white line on a dark floor and to locate a dark door on a white wall 6 meters away. In both of these tasks, subjects were significantly better in their performance with the device turned on versus turned off. The best estimated visual acuity outcome in studies by grating has been logMAR 1.8 (20/1262). Regarding reading, 21 subjects with average implant duration of 19.9 months consistently identified letters. Six of these subjects were able to read letters of reduced size, the smallest measuring 0.9 cm at 30 cm, and four subjects were able to read two-, three- and four-letter words. These results demonstrate significant advancement in the evolution of artificial vision. Currently the Argus® II is indicated for use in patients with severe to profound retinitis pigmentosa who meet the following criteria: adults age 25 years or older, bare light or no light perception in both eyes, a previous history of useful form vision, phakic or pseudophakic, and willingness and ability to receive the recommended post-implant clinical follow-up, device fitting, and visual rehabilitation. The Argus® II implant is intended to be implanted in a single eye, typically the worse-seeing eye. After surgery, patients can elect to participate in the post-approval study of the Argus® II retinal prosthesis with the objective of assessing the safety of the device and the visual function. The safety of the device is assessed by calculating the proportion of subjects who experience device- and procedure-related events and those who experience a significant ocular (i.e. rhegmatogenous or tractional retinal detachment, endophthalmitis, hypotony requiring surgical intervention, or conjunctival erosion requiring surgical intervention). Visual function is evaluated using the Functional Low-Vision Observer Rated Assessment (FLORA), an assessment that tracks how subjects perform in vision-related activities of daily living and in a computer-based visual function test with the device on and off. A total of 53 subjects will be recruited with a follow up of 5 years per subject. The Alpha-IMS is a subretinal, micro-photodiode array retinal prosthesis developed by Retina Implant AG in Reutlingen, Germany and approved in Europe in 2013. It is designed to be implanted in the layer of degenerated photoreceptor cells in patients with degenerative outer retinal disease. Consequently, electrical impulses from the device stimulate bipolar cells in the middle retinal layers which carry the signals to RGCs. An earlier version of the device with a retroauricular transdermal cable connected the device to an external battery and was implanted in 11 blind volunteers beginning in 2005. After positive visual function outcomes, a wireless version was developed which is currently undergoing single and multi-center clinical trials in Europe. The Alpha-IMS array consists of 1500 pixels each containing a photodiode to sense light intensity, an amplification circuit, and an electrode to transfer electrical impulses to adjoining retinal layers. The impulse amplitude transferred by each pixel is linked to the brightness of incoming light at the point of the pixel. The 3 mm x 3 mm x 70 micrometer array processes visual input at a rate of 5-7 hertz and is designed to be attached beneath the fovea. It sits on a polyimide foil which exits the choroid and sclera supero-temporally to connect to a power cable which leads to a subdermal, retroauricularly placed coil housed inside of a ceramic casing. This internal coil receives energy and communication wirelessly from an external coil which is held magnetically above it behind the ear. The external coil is attached to a battery pack and handheld control unit, which allows the user to adjust amplification and gain. Surgical implantation consists of extra- and intra-ocular procedures which may be performed consecutively over 6-8 hours. The extraocular procedure begins with a 4 cm arcuate, retroauricular incision and a secondary, horizontal incision of about the same size crossing the first. A raspatory is used to dissect down to the bone to expose an approximately 2 cm by 2 cm square of retroauricular bone upon and then a standard otologic drill is used to make a 3-4 mm deep implant bed for the ceramic casing containing electronics. Another incision is made near the lateral orbital rim over the margo orbitalis and the zygomatic-frontalis suture is exposed by elevating the periosteum. Intraorbital periosteum is also elevated to allow for an L-shaped canal to be drilled. A complete peritomy is performed at the limbus, and a tunnel is dissected from the subconjunctival space to the orbital rim incision. A silicone tube is inserted to keep it patent. Next, a 15 cm long, raspatory is used to tunnel beneath the periosteum of the temporal bone to connect the orbital rim incision with the retroauricular site. Then, a custom, hollow trocar is inserted anteriorly beneath the temporal periosteum and extended through to the retroauricular incision site. The power cable and subretinal implant components, protected by a silicone tube, are pulled from the retroauricular site to the orbital rim using the trocar and then inserted through the tunnel to the subconjunctival space. Prior to the intraocular procedure, electrical testing of the implant is performed. The extraocular surgery takes approximately 60-80 minutes. To begin the intraocular procedure, a standard pars-plana victretomy is performed and then a 1 by 4 mm scleral flap made 9 mm posterior to the limbus in the supero-temporal quadrant. The retina is elevated by injecting balanced saline solution or Healon. Then, a guiding tool is inserted through the sclera and choroid to a subretinal position between the choroid and the retina. Correct insertion and positioning of the guiding tool may be aided by calculating the optimal angle and distance of insertion and making a line between an insertion point and reference point marked by a corneal marker. Insertion depth may be calculated and tracked by calibration lines on the guidance tool. The polyimide foil is then introduced along the path of the guiding foil to the subretinal space. The outside end of the foil is connected to a sealed ceramic connector piece which is sutured onto the sclera. Finally a macular hole is created by separating the pigment epithelium layer from the neuroretina and the array is placed according to planned positioning as seen on fundus images prior to surgery. Alpha-IMS devices have been implanted in at least 29 participants within single and multi-center modules as a part of an ongoing clinical trial by Zrenner and colleagues. Those receiving implants had either no light perception or light perception without projection due to degenerative outer retinal diseases (25 had retinitis pigmentosa, 4 had cone-rod dystrophy) prior to implantation. Of the 29 participants, at least two serious adverse events have been reported – one increase of intraocular pressure up to 46 mmHg and the other a retinal detachment immediately after explantation of the device. Both were treated and managed without long-term sequelae. Notably, after implantation 4 of the 29 subjects could not perceive any light while the device was turned on. Though the cause was unclear, the Stingl et al. attributed this result to either failure of the device in vivo or to sequelae of the implantation surgery such as inflammation of the optic nerve or retina. The following results are a summary of visual function test performances of 29 implanted subjects described by Stingl and colleagues in their 2015 clinical trial interim report. According to the interim report, subjects with the Alpha-IMS turned on were significantly more likely to correctly perceive and localize flashes of light on a screen 60 cm away than with the device turned off, but there was no significant difference in ability to recognize the direction of movement of the flashes. These tests were performed according to the Basic Assessment of Light and Motion which has been described previously. With the device on, subjects were also significantly more likely to correctly tell the orientation of a grating than with it off, but no significant difference was seen when testing acuity with Landolt C-rings. Of the 4 subjects who passed the Landolt C-ring test, one passed with a visual acuity of 20/546. Shape and object perception, localization, and recognition were tested by placing four white objects on a black table altogether or place around a large white plate and asking subjects how many, where, and what the objects were. In the first few months, subjects performed significantly better when the device was turned on than turned off, on average perceiving and localizing 2.5 objects and naming 1 object with the device on versus 0.5 and nearly 0, respectively, when the device was off. However, after a year, performances of these tasks with the device turned off improved, and the statistical significance between the differences of performance with the device turned on and off was lost. Authors attributed visual function gains with the device turned off to a known phenomenon wherein growth factors are released in the retina after long-term electrical stimulation. Tests showed no significant increase in the ability of subjects with the device turned on to identify the time on a black clock with white hands placed at angles of 0°, 90°, or 180° to each other or to read white letters covering a visual angle of 10° on a black background. After a year, approximately 65% of subjects with the device turned on could distinguish side-by-side comparisons of differing levels of gray from each other compared to approximately 20% of subjects who could while the device was turned off. Subjectively, 8 of the 29 subjects including the 4 without light perception reported no benefit in daily life from the Alpha-IMS, another 8 reported some benefit in object localization without seeing shapes or details, while the remaining 13 (45%) reported the ability to usefully recognize shapes and some details of objects in daily experiences. The EPIRET3 system was designed by the EPI-RET Project group in Germany to be a wirelessly controlled, epiretinal device implanted completely within the eye. Electrical impulses are transferred to the retina by 25, 100 micrometer diameter electrodes arrayed in a hexagonal pattern coated in a thin film of iridium oxide and affixed to the end of a via a 40 mm long, 3 mm wide polyimide foil micro-cable which connects the electrodes to a receiver module implanted within the lens capsule. The receiver module consists of a receiver coil that wirelessly obtains transmitted data, a receiver chip that processes that data, and a stimulation chip that generates and sends impulse activation patterns to the micro-electrode array. The entire implant is coated with parylene C for biocompatibility. 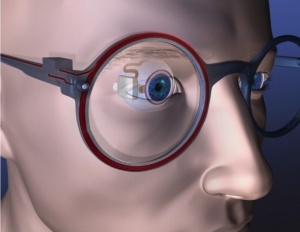 The internal coil receives temporospatial data and power wirelessly from an external coil and transmitter unit attached to glasses in front of the eye. Data and power originate from a portable computer system worn or carried by the user. Prior to EPIRET3 implantation, removal of natural or artificial intraocular lenses and vitreous must be performed and the posterior chamber filled with perfluorcarbon. A complete 20-gauge vitrectomy via the pars plana may accomplish this. Additionally, following phacoemulsification of the lens, an excentric posterior capsulotomy is created for passage of internal components. To begin implantation, the receiver module is inserted into the lens capsule via an 11 mm corneoscleral incision and secured by two trans-scleral sutures. From there, the polyimide foil cable and array are led through the defect in the posterior capsule into the vitreous chamber. The micro-electrode array is positioned within the macular region by progressively removing the perfluorcarbon cushion. Two titanium retinal tacks are used to affix the stimulator array onto the surface of the posterior pole of the retina. Before closure, the eye is filled with saline solution. Surgery reported to take less than 2 hours. Successful experimental implantation and explantation of the EPIRET3 system in 6 subjects was reported in 2009 by Roessler and colleagues. Per ethics guidelines, the devices remained in the eyes for only 28 days before explantation. Subjects all carried diagnoses of retinitis pigmentosa confirmed by ERG and had visual acuities ranging from no light perception (1/6) to light perception (4/6) to hand movements (1/6). No severe adverse events were reported in any of the subjects. However, one patient developed culture-negative hypopyon on post-implantation day 3 which was treated and cleared by day 5. During explantation, a different subject developed a macular hole which was filled with silicone oil. Although minor gliosis was visible on angiography near tack sites, visual acuity was stable at long-term follow-up for all patients. During the implantation period, the implant was turned on for visual function and stimulation testing only on days 7, 14, and 27, and the results from these tests remain unpublished. All subjects in the study completed the National Eye Institute Visual Functioning Questionnaire - 25 1 or 2 days before implantation, 3 weeks after implantation, 6 months after implantation, and 27-29 months after implantation except for one subject who was deceased at the time of long-term follow-up. Mean composite scores did not significantly differ between any of the time-points which was expected since the device was not used continuously by subjects during the implantation period. 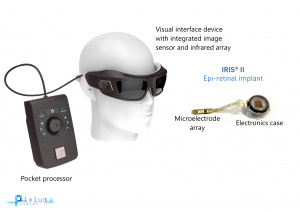 The IRIS Bionic Vision Restoration System is an epiretinal implant based on the now-disbanded Intelligent Medical Implants’ (IMI) retinal implant system now being developed by Pixium Vision, a research company based in France. Currently two versions of the IRIS, the first containing 49 micro-electrodes and the second containing 150, are registered and/or undergoing clinical trials at multiple centers across France, Germany, and Austria. Pixium vision is also developing a subretinal implant dubbed PRIMA which is in pre-clinical trials. According to the company’s website, the device includes three components: 1) an epiretinal implant attached to a built-in wireless receiver 2) a camera and transmitter unit built into a pair of glasses, and 3) a pocket computer for optimization of visual signals. Pixium touts their camera sensor and processing units as containing an array of independent pixel circuits which “encode transient (light change) information from the scene into the precise timing of spikes while sustained (light intensity) information is encoded using a simple spike rate coding scheme” up to a rate of 1 impulse per millisecond. Detailed description of surgical techniques used to implant the IRIS system are currently unavailable. The IMI retinal implant system upon which the first version of the IRIS Bionic Vision Restoration System is based was implanted for at least 1 year in 4 patients with retinitis pigmentosa and visual acuities ranging from no light perception to hand movement. Stimulation sessions throughout the year showed subjects able to perceive basic patterns such as horizontal or vertical bars or crosses. Similar results were shown in a one-time, acute stimulation study wherein 19 out of 20 subjects with retinitis pigmentosa experienced visual perceptions when micro-electrodes provided stimulation. Inspection of the retina 3 years after implantation in 3 patients showed no retinal tissue damage and well-positioned electrode arrays. Multi-center clinical trials were begun in 2013 for the IRIS version 1 and at the beginning of 2016 for IRIS version 2 with estimated enrollments of 20 and 10 subjects and estimated primary completion dates of 2017 and 2022, respectively (clinicaltrials.gov identifiers: NCT01864486 and NCT02670980, respectively). Recruitment criteria include confirmed diagnosis of retinitis pigmentosa, choroidemia, or cone-rod dystrophy and a visual acuity of logMAR 2.3 or worse in both eyes. The Boston Retinal Implant is subretinal retinal prosthesis developed by the Boston Retinal Implant Project based in Boston, MA. The current iteration improves upon a first-generation design in three significant ways: 1) an increase in power and data telemetry transfer capabilities due to a larger internal receiver coil, 2) a more resilient hermetic, titanium casing of internal circuitry, and 3) a longer cable connecting the micro-electrode array to other internal components to allow for easier implantation. 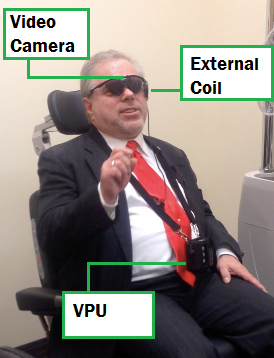 External components of the system include a computer controller with an interface which allows users to adjust parameters of retinal electrical stimulation such as strength, duration, and spatial distribution. Using power amplifiers, this computer sends power and data signals to internal components wirelessly via near-field inductive coupling. These signals are received by internal coils that sit just under the conjunctiva of the anterior eye and passed along to the internal processor which is housed in a hermetic, titanium casing and attached to the sclera in the superior nasal quadrant of the eye. Internal processors decode data signals and send stimulating impulses via a serpentine, polyimide foil to the micro-electrode array which enters the sclera and choroid in the supero-temporal quadrant and is implanted subretinally. The 16 micro-electrodes on the array are each 400 micrometers in diameter and made from sputtered iron oxide film. Each is controlled independently by corresponding internal processor channels. The following implantation techniques were used to implant devices in two minipigs weighing approximately 20 kg. Conjunctiva is dissected and a 6 mm x 2 mm scleral flap is created in the supero-temporal quadrant. After partial vitrectomy, a needle is used to raise a retinal bleb, a separation of the choroid and retinal pigment epithelium from the retina, from the front. Receiver coils and the casing containing the internal processors are secured to the sclera anteriorly and in the superior nasal quadrant, respectively. Next, an incision is made in the choroid under the scleral flap to insert the micro-electrode array. The array is positioned so that it rests in the subretinal space created by the bleb. Once the array is positioned, the serpentine, polyimide foil connecting it to the other internal components is secured to the sclera with sutures and the scleral flap is sutured close. Finally, the conjunctiva is sutured back down over the implanted receiver coils. Joseph Rizzo, the principal investigator of the Boston Retina Implant Project, has stated that his team will forego human trials until development of a device capable of 200 or more, independently controlled micro-electrodes is completed. In the meantime, implantation of the 16 micro-electrode device has been performed in two minipigs as part of pre-clinical trials. These implants remained for up to 5.5 months before explanation during which time external electrodes were used periodically to check continued function of the implants. Though these measurements showed sustained function, the devices were explanted at 3 and 5.5 months from the pigs because the internal receiver coils wore through the conjunctiva and became exposed. Since then, the shape of the coils has been altered for future long-term implantation studies. 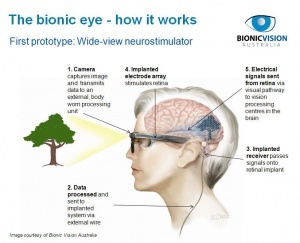 Diagram courtesy of Bionic Vision Australia. Bionic Vision Australia is a research consortium based in Australia currently developing suprachoroidal retinal prosthesis implants. 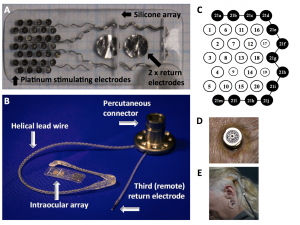 A 24 channel prototype with 20 stimulating electrodes was implanted in three volunteers as a phase I human clinical trial, but the consortium is now focusing efforts on similar 44 and 98 channel versions. The 24 channel implant contained an array of 33, 600 micrometer platinum stimulating micro-electrodes set 50 micrometers from the surface of a silicone substrate measuring 19 mm x 8 mm. Of the 33, 20 functioned as independent stimulating electrodes. This array was designed to be implanted between the sclera and the choroid behind the retina. Unlike other implant systems, this one did not use wireless transfer of energy and data. Rather, a helix of 24 platinum/iridium wires emerging from the micro-electrode ran to a percutaneously implanted connector surgically implanted behind the ear as has been done in cochlear implant studies. This connector which was surgically anchored to the skull and protruded from the skin allowed for direct connection of external electronics with the implanted array. The intraocular electrode array of the suprachoroidal device (A) and the entire device (B), showing the array connected to the percutaneous connector via a helical lead wire. The electrodes on the intraocular array (C) were numbered for analysis, with the black electrodes (21a to 21m) being ganged to provide an external ring for common ground and hexagonal stimulation parameter testing. Note electrodes 9, 17, and 19 were smaller (400 mm vs. 600 mm). The percutaneous connector protruded through the skin behind the ear (D), allowing direct connection to the neurostimulator via a connecting lead (E). The scleral incision was made 9 mm to 10 mm posteriorly from the sclero-corneal limbus. Used with permission from Ayton et al. The titanium connector piece is attached to the temporal bone with self-tapping screws after making a curved scalp incision, an incision through the posterior temporalis muscle, and dissection of the temporal periosteum. An additional incision is made in the scalp flap to allow the connector to protrude from the skin. A tunnel between the connector and the lateral orbital rim is made by dissecting under temporalis fascia, and a lateral canthotomy is performed to expose the lateral orbital margin. After incision through the periosteum, 10 mm burrs were used to perform a lateral orbitotomy below the zygomaticofrontal suture for securement of the connecting wire with custom made silicone grommet. A temporal peritomy is performed to expose and disinsert the lateral rectus muscle under which a scleral incision is made and marked with diathermy approximately 9-10 mm posterior to the limbus depending on axial globe length. After full thickness incision of the sclera with a 15 degree blade, the suprachoroidal space is dissected with a crescent blade and lens glide. To allow for micro-electrode array positioning and wire exit, an incision extending the superior wound edge posteriorly is made. After positioning of the array, visualized using indirect ophthalmoscopy during surgery, in the suprachoroidal space under the macula the wound is closed and a Dacron patch is sutured to the sclera over it. Then, the lateral rectus is reattached, the conjunctiva closed, and the connecting wire secured in the orbitotomy with the grommet. Finally, periosteum, subcutaneous tissue, and skin are closed. Surgical time is 3-4 hours. 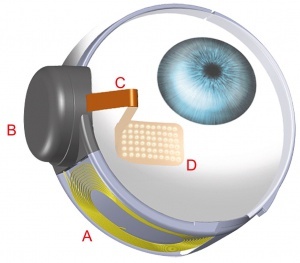 Three subjects with light perception visual acuity due to outer retinal degenerative diseases (2 with rod-cone dystrophy, 1 with syndromic retinitis pigmentosa) were implanted with suprachoroidal retinal prosthesis devices and percutaneous connectors. One year of follow-up data was published in 2014 by Ayton and colleagues and will be summarized here. The only severe adverse event was a staphylococcal infection around the percutaneous connector in one subject which was treated in the hospital and did not warrant explantation. Otherwise, post-surgical hemorrhage in the subretinal and suprachoroidal spaces was noted in all subjects, but in each case spontaneously resolved without further complications. Device stability and integrity was measured regularly using fundus photography, infrared imaging, OCT, and impedance studies. Imaging showed no movements of the device, but distance from the device to the RPE markedly increased over the course of the year in two subjects. In one, the distance increased from roughly 600 micrometers to 900 micrometers and in the other from roughly 500 micrometers to 1000 micrometers as measured by OCT. In these, OCT showed a hyper-reflective band which authors could not explain develop between the choroid and the retina. Impedance studies showed significantly decreased micro-electrode impedance in one subject over time which was thought to be due to changes in the electrode-tissue interface. For visual function testing, a head-mounted video camera and a reconstruction filter processing algorithm were used to send electrical stimulation data to the micro-electrode array. All 3 subjects scored significantly better with the device on than with it off in the Basic Assessment of Light and Motion light localization test wherein identification of the position of a block of light on 30-inch monitor from 57 cm away was tested. Data for the Landolt-C task was reported for one subject whose visual acuity was estimated to be logMAR 2.62 (20/8397) on average with the device on. With the device off, the same subject was unable to see any Landolt-C optotypes. Despite numerous advances in retinal prosthetic device understanding, design, and implementation over the last few decades, there remain significant questions to answer and hurdles to overcome in the work to develop a stable, long-term, useful prosthesis. Perhaps the most critical of these pertain to our lack of understanding of retinas affected by degenerative changes. Although viable RGCs and middle layer neurons such as bipolar cells remain after photoreceptors atrophy and clinical vision loss occurs, it is difficult to quantify viability or to know who among implant candidates may have useful vision recovery. And, since most affected individuals suffer from progressive diseases, long-term viability of retinal interfaces is uncertain. Furthermore, it has been shown that retinal network architecture undergoes significant remodeling as a consequence of photoreceptor degeneration. It remains to be seen how much useful vision may be achieved by retinal prosthesis devices throughout the time course of these remodeling processes. More critical questions and challenges arise from the study of the interface between the retina and prosthetic device micro-electrodes. Although it has been demonstrated that electrical charge transfer may be achieved over several years without major adverse effects, the effects of chronic stimulation of the retina at different levels are simply unknown. There are also gaps in knowledge about how the retina processes electrical charge transfer from electrodes that are hundreds of times larger than photoreceptors and how this may affect restorative visual resolution.45 One may also question whether epiretinal devices, because of their implant site, may be stimulating crossing RGC fibers coming from various locations. Technological challenges related to the number and size of micro-electrode arrays are another challenge facing development teams today. The question of how many independently activated micro-electrodes in an array it will take to make useful visual functional improvement is ever present. For example, the Boston Retinal Implant Project group has decided not to bring development of their device into human clinical trials until they can put 200 electrodes on the array due to concerns of useful visual function. However, creating arrays with smaller and more electrodes is an engineering challenge. Moreover, as arrays become larger, implanting them and ensuring close conformity for optimal contact with retinal tissue will become more difficult. Finally, improvements in implanted device resilience and functionality must be made since some devices, especially the more delicate subretinal arrays, have failed after implantation. With at least 5 retinal prosthesis systems either currently undergoing or nearing human clinical trials for outer retinal degenerative diseases including one for advanced macular degeneration, it seems the future of retinal prosthesis devices holds promise. However, visual function outcomes thus far have been modest being limited to high-contrast object recognition, localization, reading and basic navigation at best. The best visual acuity estimates for implant subjects have not even approached the threshold of legal blindness as defined in most countries. Nevertheless, the prospect of giving patients suffering from outer retinal diseases enough visual function to be useful in these basic functions while hoping for more dramatic outcomes in some future day pushes research forward. ↑ 1.0 1.1 Hadjinicolaou, A. E., Meffin, H., Maturana, M. I., Cloherty, S. L. & Ibbotson, M. R. Prosthetic vision: devices, patient outcomes and retinal research. Clin. Exp. Optom. 98, 395–410 (2015). ↑ Foerster, O. Beitrage zur Pathophysiologie der Sehbahn und der Sehsphare. J. Für Psychol. Neurol. 39, 463–485 (1929). ↑ Tassicker, G. E. Preliminary report on a retinal stimulator. Br. J. Physiol. Opt. 13, 102–105 (1956). ↑ 4.0 4.1 4.2 4.3 4.4 Rizzo, J. F. Update on Retinal Prosthetic Research: The Boston Retinal Implant Project: J. Neuroophthalmol. 31, 160–168 (2011). ↑ Humayun MS et al. VIsual perception elicited by electrical stimulation of retina in blind humans. Arch. Ophthalmol. 114, 40–46 (1996). ↑ Humayun, M. S. et al. Pattern electrical stimulation of the human retina. Vision Res. 39, 2569–2576 (1999). ↑ Rizzo, J. F., Wyatt, J., Loewenstein, J., Kelly, S. & Shire, D. Methods and Perceptual Thresholds for Short-Term Electrical Stimulation of Human Retina with Microelectrode Arrays. Investig. Opthalmology Vis. Sci. 44, 5355 (2003). ↑ 8.0 8.1 8.2 8.3 8.4 Luo, Y. H.-L. & da Cruz, L. The Argus(®) II Retinal Prosthesis System. Prog. Retin. Eye Res. 50, 89–107 (2016). ↑ 9.0 9.1 9.2 Dagnelie, G. Retinal Implants: Emergence of a multidisciplinary field. Curr. Opin. Neurol. 25, 67–75 (2012). ↑ 10.0 10.1 10.2 10.3 Loewenstein JI, Montezuma SR, Rizzo JF & III. 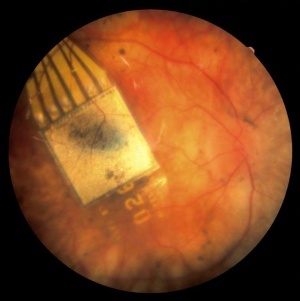 Outer retinal degeneration: An electronic retinal prosthesis as a treatment strategy. Arch. Ophthalmol. 122, 587–596 (2004). ↑ 12.0 12.1 12.2 Humayun, M. S. et al. Interim Results from the International Trial of Second Sight’s Visual Prosthesis. Ophthalmology 119, 779–788 (2012). ↑ 13.0 13.1 Rizzo, S. et al. The Argus II Retinal Prosthesis: 12-Month Outcomes from a Single-Study Center. Am. J. Ophthalmol. 157, 1282–1290 (2014). ↑ Luo, Y. H.-L. et al. The use of Argus® II Retinal Prosthesis to Identify Common Objects in Blind Subjects with Outer Retinal Dystrophies. Invest. Ophthalmol. Vis. Sci. 55, 1834–1834 (2014). ↑ Ahuja, A. K. et al. Blind subjects implanted with the Argus II retinal prosthesis are able to improve performance in a spatial-motor task. Br. J. Ophthalmol. 95, 539–543 (2011). ↑ da Cruz, L. et al. The Argus II epiretinal prosthesis system allows letter and word reading and long-term function in patients with profound vision loss. Br. J. Ophthalmol. 97, 632–636 (2013). ↑ Geruschat, D. R. et al. FLORATM: Phase I development of a functional vision assessment for prosthetic vision users. Clin. Exp. Optom. 98, 342–347 (2015). ↑ 18.0 18.1 18.2 18.3 18.4 18.5 18.6 18.7 Stingl, K. et al. Subretinal Visual Implant Alpha IMS – Clinical trial interim report. Vision Res. 111, Part B, 149–160 (2015). ↑ Stingl, K. et al. Artificial vision with wirelessly powered subretinal electronic implant alpha-IMS. Proc. R. Soc. B Biol. Sci. 280, (2013). ↑ 20.0 20.1 Koitschev, A. et al. Extraocular Surgical Approach for Placement of Subretinal Implants in Blind Patients: Lessons from Cochlear-Implants. J. Ophthalmol. 2015, (2015). ↑ Besch, D. et al. Extraocular surgery for implantation of an active subretinal visual prosthesis with external connections: feasibility and outcome in seven patients. Br. J. Ophthalmol. 92, 1361–1368 (2008). ↑ Kusnyerik, A. et al. Positioning of Electronic Subretinal Implants in Blind Retinitis Pigmentosa Patients Through Multimodal Assessment of Retinal Structures. Investig. Opthalmology Vis. Sci. 53, 3748 (2012). ↑ Kitiratschky, V. B. D. et al. Safety evaluation of ‘retina implant alpha IMS’—a prospective clinical trial. Graefes Arch. Clin. Exp. Ophthalmol. 253, 381–387 (2014). ↑ Bach, M., Wilke, M., Wilhelm, B., Zrenner, E. & Wilke, R. Basic Quantitative Assessment of Visual Performance in Patients with Very Low Vision. Investig. Opthalmology Vis. Sci. 51, 1255 (2010). ↑ Schatz, A. et al. Transcorneal Electrical Stimulation for Patients with Retinitis Pigmentosa: A Prospective, Randomized, Sham-Controlled Exploratory Study. Investig. Opthalmology Vis. Sci. 52, 4485 (2011). ↑ Chow, A. Y., Bittner, A. K. & Pardue, M. T. The Artificial Silicon Retina in Retinitis Pigmentosa Patients (An American Ophthalmological Association Thesis). Trans. Am. Ophthalmol. Soc. 108, 120–154 (2010). ↑ 27.0 27.1 27.2 Roessler, G. et al. Implantation and Explantation of a Wireless Epiretinal Retina Implant Device: Observations during the EPIRET3 Prospective Clinical Trial. Investig. Opthalmology Vis. Sci. 50, 3003 (2009). ↑ 28.0 28.1 28.2 28.3 Menzel-Severing, J. et al. Implantation and explantation of an active epiretinal visual prosthesis: 2-year follow-up data from the EPIRET3 prospective clinical trial. Eye 26, 501–509 (2012). ↑ Montezuma, S. R., Loewenstein, J., Scholz, C. & Rizzo, J. F. Biocompatibility of Materials Implanted into the Subretinal Space of Yucatan Pigs. Investig. Opthalmology Vis. Sci. 47, 3514 (2006). ↑ 30.0 30.1 Roessler, G. et al. Angiographic findings following tack fixation of a wireless epiretinal retina implant device in blind RP patients. Graefes Arch. Clin. Exp. Ophthalmol. 249, 1281–1286 (2011). ↑ Mangione, C. M. et al. Development of the 25-item National Eye Institute Visual Function Questionnaire. Arch. Ophthalmol. Chic. Ill 1960 119, 1050–1058 (2001). ↑ Lee, D. Y., Lorach, H., Huie, P. & Palanker, D. Implantation of Modular Photovoltaic Subretinal Prosthesis. Ophthalmic Surg. Lasers Imaging Retina 47, 171–174 (2016). ↑ Richard, G., Keserue, M., Feucht, M., Post, N. & Hornig, R. Visual Perception After Long-Term Implantation of a Retinal Implant. Invest. Ophthalmol. Vis. Sci. 49, 1786–1786 (2008). ↑ Keserü, M. et al. Acute electrical stimulation of the human retina with an epiretinal electrode array. Acta Ophthalmol. (Copenh.) 90, e1–e8 (2012). ↑ Keserue, M., Post, N., Hornig, R., Zeitz, O. & Richard, G. Long Term Tolerability of the First Wireless Implant for Electrical Epiretinal Stimulation. Invest. Ophthalmol. Vis. Sci. 50, 4226–4226 (2009). ↑ 37.0 37.1 37.2 37.3 37.4 Kelly, S. K. et al. A Hermetic Wireless Subretinal Neurostimulator for Vision Prostheses. IEEE Trans. Biomed. Eng. 58, 3197–3205 (2011). ↑ 39.0 39.1 39.2 Ayton, L. N. et al. First-in-Human Trial of a Novel Suprachoroidal Retinal Prosthesis. PLoS ONE 9, (2014). ↑ Honert, C. van den & Kelsall, D. C. Focused intracochlear electric stimulation with phased array channelsa). J. Acoust. Soc. Am. 121, 3703–3716 (2007). ↑ Saunders, A. L. et al. Development of a surgical procedure for implantation of a prototype suprachoroidal retinal prosthesis. Clin. Experiment. Ophthalmol. 42, 665–674 (2014). ↑ Lieby, P. et al. Evaluating Lanczos2 Image Filtering for Visual Acuity In Simulated Prosthetic Vision. Invest. Ophthalmol. Vis. Sci. 54, 1049–1049 (2013). ↑ 45.0 45.1 Luo, Y. H.-L. & da Cruz, L. A review and update on the current status of retinal prostheses (bionic eye). Br. Med. Bull. 109, 31–44 (2014). ↑ 46.0 46.1 Ghezzi, D. Retinal prostheses: progress toward the next generation implants. Front. Neurosci. 9, (2015). This page was last modified on November 12, 2018, at 17:36. This page has been accessed 55,085 times.